Approximately 70,000 new major amputations are performed annually in the United States. Worldwide, 200-500 million major amputations are performed each year. The image below depicts various levels of lower-extremity amputations. The various levels of lower-extremity amputations. Amputations occur on the right side and the left side in equal proportion. Amputations might be required for several reasons. Peripheral vascular disease predominates and is seen in about 65% of cases. It often occurs with diabetes. Patients with this disease are usually aged 60-75 years. Amputations due to trauma occur in 25% of all cases; most of these patients are aged 17-55 years. In the pediatric age group, trauma causes about 75% of acquired amputations, usually from accidents with power tools such as lawnmowers. Malignancy with or without other disease is the third most common cause, leading to about 5% of amputations. Cancers such as osteogenic sarcoma are involved in about 25% of acquired amputations in those aged 10-20 years. Congenital limb deficiency results in as many as 5% of all amputations, and 60% of the cases involve children. Congenital cases outnumber acquired cases by a ratio of 2:1 in the pediatric age group. Before any kind of pathologic gait can be examined and analyzed, the patient's normal gait and the terminology used in describing the different components of normal gait must be understood. Although any component can be used as the starting point in the gait cycle, starting with initial contact is advantageous. For example, if the left foot is the starting point or reference, the cycle continues until the left foot makes initial contact again. The distance covered during this cycle is called a stride length. A step length is one half the stride length. The components of the gait cycle can be divided into 2 phases: (1) the stance phase and (2) the swing phase. The stance phase is when the foot is making contact with the ground. It covers the first 4 components of the gait cycle. The swing phase is when the foot is moving forward through the air and consists of the other 3 components of the gait cycle. Each of the 7 components of the gait cycle is examined in more detail below, with reference to the particular muscle activity in the lower extremity. Initial contact, frequently called heel strike, is the first component of the gait cycle. On heel contact, the major role of the lower extremity is to absorb the impact forces created when the foot strikes the ground. The anatomy and morphology of the heel pad, along with control of the ankle as the foot moves from the heel to the forefoot, allow the absorption of the forces. On contact, the hip extensors, gluteus maximus, and hamstrings create internal extensor movement at the hip. These muscles concentrically contract and propagate an extension force at the hip joint. Concurrently, the knee demonstrates an internal flexor moment secondary to the contraction of the hamstrings to block hyperextension at the end of the swing phase. The ankle is usually kept in the neutral position on initial contact in preparation for the next phase. The loading response is the double support period between the components' initial contact and opposite toe-off. The foot is lowered to the ground by means of plantarflexion of the ankle, which is simultaneously resisted by dorsiflexion produced by the tibialis anterior. These actions maintain control of the foot and allow gentle lowering of the foot to the ground. At this point, the center of gravity is at its lowest point in the gait cycle. After the loading response occurs, opposite toe-off is the next component of the gait cycle. It is the beginning of midstance and the first period of single support. The forefoot impacts the ground at about the same time opposite toe-off occurs. The hips move steadily through extension with power, while the knee generates an external flexor movement. The quadriceps muscles eccentrically contract, absorbing energy and allowing the knee to act like a spring (prohibiting the vertical force from rising too rapidly). The direction of the ankles shifts from plantarflexion to dorsiflexion when the tibia passes over the stationary foot. Midstance is the period between opposite toe-off and heel rise. It signifies the moment when the swing-phase leg passes the stance-phase leg. During the period, the hip begins to lose its extensor movement with a decline in contraction of the gluteus maximus and hamstrings. The knee shifts its motion from flexion to extension and at the same time generates power. As the tibia moves forward over the ankle due to the inertia created by the trunk, it undergoes external rotation concomitant with forefoot supination. The ankle continues to shift from plantarflexion to dorsiflexion with the triceps surae muscle (gastrocsoleus complex) contracting eccentrically. The speed at which the center of mass of the body moves over the supporting stance-phase limb is regulated by the power created during plantarflexion of the ankle. Heel rise is the next component of the gait cycle. As the name describes, the heel begins to lift from the walking surface. A progressive internal flexor moment is created at the hip, while an internal flexor knee moment is initiated when the quadriceps muscles stop contracting before heel rise. The knee action is thought to occur because the upper body moves faster that the tibia and because the triceps surae retards the forward motion of the tibia while the femur steadily moves forward. These motions create an external extensor moment opposed by an internal flexor moment at the knee. The ankle has an internal dorsiflexor moment as the soleus and the gastrocnemius begin to progressively contract. Opposite initial contact signifies the start of preswing. With the start of opposite initial contact, the hip and knee begin to flex while the ankle is plantarflexing. Of note, the body now pivots on the forefoot instead of the ankle. This is the component of the gait cycle that creates the most power; the triceps surae and other secondary ankle plantarflexors create a corresponding internal plantarflexor moment in response to the external dorsiflexor moment. These muscles use an eccentric contraction. Consequently, the triceps surae is used to impede the body's momentum instead of launching it forward. This allows favorable ankle stabilization and a decline in the amount of fall by the body's center of gravity; therefore, the component of heel rise mentioned previously would be more appropriately named roll-off. In addition, the adductor longus muscle acts as the primary hip flexor in this phase, and the rectus femoris muscle contracts eccentrically to stabilize knee flexion. All of these actions assist with forward acceleration of the leg into the swing phase. The next component, toe-off, marks the end of the stance phase and the beginning of the swing phase. Muscle contraction changes from eccentric in stance phase to concentric in swing phase. Toe-off occurs at about the 60% point of the gait cycle. An internal flexor moment occurs at the hip secondary to inertial forces and contraction of the adductor longus and iliopsoas muscles. The rectus femoris muscle contracts to prevent excessive knee flexion, and the internal plantarflexion moment loses power at the ankle as the toe leaves the ground. Feet adjacent is the next stage of the swing phase. A lot of power is generated at the hip by the rectus femoris, adductor, and iliopsoas muscles to move the leg forward through the swing phase. Eccentric contraction of the quadriceps continues throughout the first half of the swing phase to regulate the rate and extent of knee flexion. Some of the kinetic energy created through contraction and inertia is transferred to the trunk as the swing leg is decelerated at the end of this phase. The last component of the gait cycle is tibia vertical, which is signified by the tibia of the swinging leg becoming vertical. This is the period between midswing and terminal swing. In this phase, the knee extends in preparation for the beginning of the stance phase. This extension is accomplished through 2 mechanisms: (1) concentric contraction of the hip extensors causes a posterior rotation at the thigh, and (2) inertia created at the foot and shank allow continued forward movement. Eccentric contractions of the hamstrings gradually decelerate the foot and shank until the knee arrives at an extended position. At this point, the swing-phase leg not only is prepared for the next stance phase but also is helped with trunk acceleration. As mentioned before, some of the kinetic energy created during the swing phase is transferred to the trunk upon deceleration. This kinetic energy causes greater trunk acceleration than that due to the energy created during heel rise. Several factors need to be accounted for when thinking about the energy costs of prosthetic ambulation. One is the actual metabolic costs (peak exercise oxygen consumption [VO2] in mL/kg/m) of the person who has undergone amputation (see the Oxygen Consumption calculator). Metabolic cost is based on the metabolic oxygen consumption in relation to the distance walked. Clinically, metabolic cost is a gauge of endurance. In the healthy intact person, walking is more efficacious at self-selected walking speeds. The metabolic cost rises at slower or faster rates of ambulation. Comparatively, persons who have undergone amputations exhibit the same correlation between metabolic cost and ambulation speed, with the metabolic costs exceeding the norm at any given walking speed. The increased metabolic cost for persons who have undergone amputations means that the gait is less efficient than that of healthy intact persons, whorequire less endurance for any given distance. A pathologic gait is an inefficient mode of locomotion that usually requires considerably more energy than a normal gait. Patients may adopt many kinds of abnormal movements to minimize their energy usage. Two methods of energy optimization exist: those involving energy transfers and those involving movements that minimize the displacement of the center of gravity. These optimizations can be combined to create a smoother gait and reduced energy expenditure by minimizing the downward and lateral motion of the center of gravity. With the healthy intact person incorporating these movements, displacement of the center of gravity is approximately 2.3 cm in each direction. Patients with various amputations have adopted strategies for minimizing their energy consumption in ambulation. In persons who have undergone TT amputations, the timing and magnitude of the muscular work patterns in the intact limb are correlated with a normal gait. However, the prosthetic limb must make up for the energy absorption of the quadriceps and triceps surae muscles and for the eccentric power generation of the triceps surae. During the stance phase, the prosthetic limb performs about 50% of the work of normal muscle. Energy absorption by the knee extensors and energy generation by the prosthetic foot are substantially reduced. To offset the loss of power from triceps surae with roll-off, the person who has undergone amputation changes the biomechanics of both the prosthetic limb in the stance phase and the intact limb during the swing phase. In the prosthetic limb, the primary energy absorbers and generators shift to the hip extensors during the stance phase. Also, during swing phase, the muscular work components substantially increase in the intact limb. The excess mechanical work is ultimately transmitted to the trunk during terminal swing-phase deceleration. The increase in the forward momentum of the trunk compensates for the loss of power generation with the prosthetic foot. The person who has undergone TF amputation must deal with the loss of the foot, ankle, and knee. The biggest concern of the person who has undergone TF amputation is the prevention of knee buckling. Besides the actual prosthetic hardware and knee alignment to add stability, the biomechanics of the gait are changed to provide additional stability. The person who has undergone TF amputation does not allow knee flexion in the first 30-40% of the stance phase. This limitation minimizes the likelihood of knee buckling. In addition, the hip extensors help maintain hip extension through closed kinetic chain mechanisms. In the opposite initial contact part of the gait cycle, the ankle plantarflexors, particularly the triceps surae and the hip flexors, contract to generate power for the acceleration of the leg forward into the swing phase. Although the prosthetic limb is only approximately 30% of its normal mass with a TF amputation, the hip flexors must generate the same power as a normal limb. The intact limb adjusts to compensate for the prosthetic limb in these cases. During the stance phase in the intact limb, generated energy is augmented by the hip extensors and the ankle plantarflexors. In this way, a person who has undergone amputation tries to offset the loss of power from the triceps surae in the prosthetic limb. During the swing phase, the biomechanics of the person who has undergone TF amputation mimic those of the person with a normal gait, including the energy-absorbing function of the quadriceps performed through the prosthetic hydraulic knee unit. Stance-phase problems can occur in the gait of individuals with a TT prosthetic. [18, 19, 20] Inappropriate knee flexion can occur in the early stance phase, causing knee instability. Several problems could arise from this flexion, including excessive ankle dorsiflexion, socket flexion, and posterior foot placement. Knee hyperextension could also occur in the early stance phase, emanating from ankle plantarflexion or socket extension, weak knee extensors, anterior foot placement, or inadequate prosthetic foot selection. Mediolateral knee thrust can also be observed in the stance phase. This is usually derived from inadequate side-to-side placement of the foot, excessive angulation of the socket, or wide mediolateral proximal socket dimensions that cause decreased knee control. If an individual who has undergone a TT amputation is noted to have a foot slap in his or her gait, it may be a result of excessive socket flexion or foot dorsiflexion, the uneven placement of the foot, or a deficient heel height for proper prosthetic alignment. Excessive forward progression of the tibia, or a drop-off gait, can be caused by impaired rollover, shortening of the contralateral step length and swing time, and delayed heel-off. External rotation can occur at 2 different phases of the gait cycle: heel strike or late stance. If external rotation occurs during heel strike, the etiology could be a solid ankle cushion heel (SACH) durometer that is too dense, an articulated foot plantarflexion bumper that is too hard, or misplacement of the suspension cuff-retention points. If external rotation occurs in late stance, it can be caused by inadequate excessive anterior placement of the foot, excessive foot plantarflexion, or excessive hardness of the forefoot. Early heel rise could result from inadequate placement of the foot (posterior), flexion contracture in the hip or the knee that was not accounted for in fitting the prosthetic, or excessive softness of the forefoot. Contralateral early heel rise or vaulting is a pathologic gait that allows clearance of the prosthetic limb with decreased hip and knee flexion. Vaulting compensates for a prosthesis that is too long, inadequate suspension of the prosthesis, or a learned gait pattern. Fewer gait problems are involved with the swing phase than with the stance phase. The objective of the swing phase is forward advancement of the non–weight-bearing limb. When prosthetic limb clearance is poor, the gait becomes pathologic. Most predicaments occur because of poor suspension, a prosthesis that is too long, insufficient prosthetic knee flexion, or inadequate transfer of power from the residual limb to the prosthesis that decreases or delays knee flexion. A coordinated, smooth swing phase is facilitated by energy-efficient limb clearance, which is enabled by synchronized motion at the hip and knee joints and by total joint displacement. Foot drag is one of the most common problems of swing phase. It is usually caused by inadequate suspension of the prosthesis, a prosthesis that is too long, or lower-limb weakness in the hip abductors or ankle plantarflexors on the contralateral side. Any abnormal limb rotation that is observed during the gait trial is usually caused by insufficient suspension of the prosthesis, misplacement of the suspension cuff-retention points, or overshooting (infringement) of the hip or knee flexors to evade foot drop. Limited knee extension or flexion problems can always be traced back to mechanical contractures, problems with the suspension, or problems with the knee joint in relation to a thigh corset. 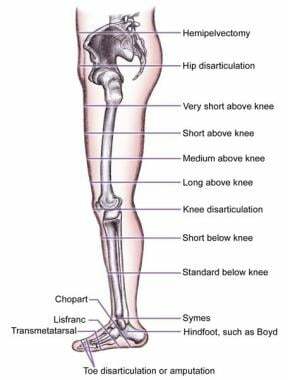 Additional etiologies of knee flexion in stance are a hard SACH durometer, excessive foot dorsiflexion, excessive socket flexion, weak hip extensors, or decreased weight bearing. Prolonged knee extension in the stance phase is another problem that can occur with TF amputations. This extension can result in shortening of the contralateral step and an increase in the vertical displacement of the center of gravity. If lateral hip thrust is the problem, immediate attention should be given to the wide dimensions of the mediolateral proximal socket that affect the stability of the hip. If the socket fits well, the patient could have weak hip abductors, or the hip adductors may not have been reattached at the time of surgery. The most prevalent gait abnormality with TF amputations is ipsilateral trunk bending in the stance phase. Similar to the compensation for Trendelenburg gait, this abnormality could indicate weak hip abductors on the ipsilateral side or an inappropriately short prosthesis. Occasionally, a person who has undergone a TF amputation can have an awkward downward movement of the upper body over the prosthesis, especially during fast walking. This is referred to as a drop-off gait in the late stance. The foot of the prosthesis should be checked for excessive dorsiflexion whenever external rotation of the leg occurs, either during heel strike or in the late stance. The foot should be examined for excessively hard materials. As with TT amputations, TF amputations can be associated with some of the same problems in the stance phase; the etiologies of the abnormal biomechanics are similar. In persons who have undergone TF amputations, gait abnormalities in swing phase are limited in number. Stiff-knee gait patterns can be the consequence of excessive knee stability in the joint that makes the creation of a flexion moment at the knee difficult. Circumduction, or the swing of the limb in a wide arc, usually indicates inadequate suspension or excessive length of the prosthesis. Abnormal axis rotation at the knee that results in a whipping motion is usually due to incorrect alignment of the prosthesis at the knee. A multidisciplinary approach is a definite benefit in the diagnosis and treatment of pathologic gait. An amputation is supposed to optimize the overall function of the patient. This is accomplished through the proper prescription of a prosthetic and appropriate rehabilitation training. Atherton R, Robertson N. Psychological adjustment to lower limb amputation amongst prosthesis users. Disabil Rehabil. 2006 Oct 15. 28(19):1201-9. [Medline]. Badura-Brzoza K, Matysiakiewicz J, Piegza M, Rycerski W, Niedziela U, Hese RT. [Sociodemographic factors and their influence on anxiety and depression in patients after limb amputation]. Psychiatr Pol. 2006 Mar-Apr. 40(2):335-45. [Medline]. Bosmans JC, Suurmeijer TP, Hulsink M, van der Schans CP, Geertzen JH, Dijkstra PU. Amputation, phantom pain and subjective well-being: a qualitative study. Int J Rehabil Res. 2007 Mar. 30(1):1-8. [Medline]. Rosenblatt NJ, Bauer A, Rotter D, Grabiner MD. Active dorsiflexing prostheses may reduce trip-related fall risk in people with transtibial amputation. J Rehabil Res Dev. 2014. 51(8):1229-42. [Medline]. Czerniecki JM. Rehabilitation in limb deficiency. 1. Gait and motion analysis. Arch Phys Med Rehabil. 1996 Mar. 77(3 Suppl):S3-8. [Medline]. Dormandy J, Heeck L, Vig S. Major amputations: clinical patterns and predictors. Semin Vasc Surg. 1999 Jun. 12(2):154-61. [Medline]. Perry J. Gait Analysis: Normal and Pathological Function. SLACK, Inc. 1992. Tokuno CD, Sanderson DJ, Inglis JT, Chua R. Postural and movement adaptations by individuals with a unilateral below-knee amputation during gait initiation. Gait Posture. 2003 Dec. 18(3):158-69. [Medline]. Whittle MW. Gait Analysis: An Introduction. 2nd ed. Oxford, England:. Butterworth-Heinemann. 1996. Baum BS, Schnall BL, Tis JE, Lipton JS. Correlation of residual limb length and gait parameters in amputees. Injury. 2008 Jul. 39(7):728-33. [Medline]. Aprile I, Galli M, Pitocco D, Di Sipio E, Simbolotti C, Germanotta M, et al. Does First Ray Amputation in Diabetic Patients Influence Gait and Quality of Life?. J Foot Ankle Surg. 2018 Jan - Feb. 57 (1):44-51. [Medline]. Su PF, Gard SA, Lipschutz RD, Kuiken TA. The effects of increased prosthetic ankle motions on the gait of persons with bilateral transtibial amputations. Am J Phys Med Rehabil. 2010 Jan. 89(1):34-47. [Medline]. [Full Text]. Morgan SJ, McDonald CL, Halsne EG, Cheever SM, Salem R, Kramer PA, et al. Laboratory- and community-based health outcomes in people with transtibial amputation using crossover and energy-storing prosthetic feet: A randomized crossover trial. PLoS One. 2018. 13 (2):e0189652. [Medline]. [Full Text]. Jeans KA, Karol LA, Cummings D, Singhal K. Comparison of gait after Syme and transtibial amputation in children: factors that may play a role in function. J Bone Joint Surg Am. 2014 Oct 1. 96(19):1641-7. [Medline]. Ernst M, Altenburg B, Bellmann M, Schmalz T. Standing on slopes - how current microprocessor-controlled prosthetic feet support transtibial and transfemoral amputees in an everyday task. J Neuroeng Rehabil. 2017 Nov 16. 14 (1):117. [Medline]. [Full Text]. Wolf SI, Alimusaj M, Fradet L, Siegel J, Braatz F. Pressure characteristics at the stump/socket interface in transtibial amputees using an adaptive prosthetic foot. Clin Biomech (Bristol, Avon). 2009 Dec. 24(10):860-5. [Medline]. Hordacre B, Bradnam LV, Barr C, Patritti BL, Crotty M. Ipsilateral corticomotor excitability is associated with increased gait variability in unilateral transtibial amputees. Eur J Neurosci. 2014 Jul. 40(2):2454-62. [Medline]. Chow DH, Holmes AD, Lee CK, Sin SW. The effect of prosthesis alignment on the symmetry of gait in subjects with unilateral transtibial amputation. Prosthet Orthot Int. 2006 Aug. 30(2):114-28. [Medline]. Nadollek H, Brauer S, Isles R. Outcomes after trans-tibial amputation: the relationship between quiet stance ability, strength of hip abductor muscles and gait. Physiother Res Int. 2002. 7(4):203-14. [Medline]. Selles R, Bussmann J, Van Soest AJ, Stam H. The effect of prosthetic mass properties on the gait of transtibial amputees--a mathematical model. Disabil Rehabil. 2004 Jun 17. 26(12):694-704. [Medline]. Jia X, Suo S, Meng F, Wang R. Effects of alignment on interface pressure for transtibial amputee during walking. Disabil Rehabil Assist Technol. 2008 Nov. 3(6):339-43. [Medline]. Barnett C, Vanicek N, Polman R, Hancock A, Brown B, Smith L, et al. Kinematic gait adaptations in unilateral transtibial amputees during rehabilitation. Prosthet Orthot Int. 2009 Jun. 33(2):135-47. [Medline]. Portnoy S, Yizhar Z, Shabshin N, Itzchak Y, Kristal A, Dotan-Marom Y, et al. Internal mechanical conditions in the soft tissues of a residual limb of a trans-tibial amputee. J Biomech. 2008. 41(9):1897-909. [Medline]. Sjödahl C, Jarnlo GB, Söderberg B, Persson BM. Pelvic motion in trans-femoral amputees in the frontal and transverse plane before and after special gait re-education. Prosthet Orthot Int. 2003 Dec. 27(3):227-37. [Medline]. Frossard L, Stevenson N, Smeathers J, Häggström E, Hagberg K, Sullivan J, et al. Monitoring of the load regime applied on the osseointegrated fixation of a trans-femoral amputee: a tool for evidence-based practice. Prosthet Orthot Int. 2008 Mar. 32(1):68-78. [Medline]. McNealy LL, Gard SA. Effect of prosthetic ankle units on the gait of persons with bilateral trans-femoral amputations. Prosthet Orthot Int. 2008 Mar. 32(1):111-26. [Medline]. Datta D, Harris I, Heller B, Howitt J, Martin R. Gait, cost and time implications for changing from PTB to ICEX sockets. Prosthet Orthot Int. 2004 Aug. 28(2):115-20. [Medline]. Esquenazi A. Analysis of prosthetic gait. In: Physical Medicine and Rehabilitation: State of the Art Reviews. Vol 8. 1994:201-221. Hofstad C, Linde H, Limbeek J, Postema K. Prescription of prosthetic ankle-foot mechanisms after lower limb amputation. Cochrane Database Syst Rev. 2004. (1):CD003978. [Medline]. Mahon CE, Farris DJ, Sawicki GS, Lewek MD. Individual limb mechanical analysis of gait following stroke. J Biomech. 2015 Feb 7. [Medline]. Selles RW, Janssens PJ, Jongenengel CD, Bussmann JB. A randomized controlled trial comparing functional outcome and cost efficiency of a total surface-bearing socket versus a conventional patellar tendon-bearing socket in transtibial amputees. Arch Phys Med Rehabil. 2005 Jan. 86(1):154-61; quiz 180. [Medline].